Retro, sweet retro. And almost nothing had changed in attitude! With a little exception of Starbucks madness, though… They opened 2 weeks ago on a prime corner site – Pohjoisesplanadi and Keskuskatu, and still (!!!) people are queueing to get their latte. Is it actually the taste, the pop culture reference or the personal touch when a complete stranger writes your name on a cup? Anyway, one relatively small Starbucks doesn’t change the whole picture of Finnish consumer patriotism, does it? “– And this smoked salmon, is it from Finland? Well, this is my rough translation of the grammatical example from YLE’s famous “Super Finnish” on-line course. However, the point of quoting it here is not to showcase the use of partitiivi case practiced in the exercise, but the innate skill of always choosing kotimainen practiced by Finns 24/7. In this country the power of kotimainen (homemade/grown/produced) cannot be underestimated and costly price tags are not the only proof (in fact, one might think these weighty sums are just indicating a keen marketing policy on the part of the manufacturers). But then again, what about people’s choices? 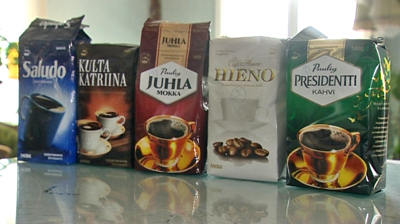 There was a time when being invited to a Finns house I used to turn my cup of Paulig coffee upside down (after drinking it, of course) just to check out the brand name – either Iitala or Arabia. In theory, it could be Ikea but then the hosts were most likely to be Swedish-speaking Finns or newly-weds. ko textile bag? Or that there is at least one Tunturi-Helkama bicycle or moped per capita? Or that every child jumps happily in the puddles wearing a Rukka waterproof outfit and rubber boots that are protected by all possible copyrighted creatures? In fact, who dares to wear anything with Spiderman on it in Finland when there are the Moomins? The unwritten rule for the population to go for homemade things and therefore strengthen the market position of local products is an amazing feature of Finnish society that irritates some visitors and inspires respect in others. But seriously, what can be more patriotic than food patriotism and a “buy local” motto? I mean, there is a difference between just wrapping yourself in the national flag during vappu madness, and reaching everyday for a little white and blue symbol on the package. Me, I’m not quite there yet. My hand stops hesitantly in the supermarket not knowing which to choose: the giant Disney-like ruddy apples that played the mischief to Snow White, or those little fruits Made in Finland? And still, because of my tight budget, I go for Disney. But I’m sure to pack it into a cheerful bag with the unmistakeable pink poppies pattern – which means kotimainen syndrome slowly rubs off, after all.